NCFM Certification: Are you looking for NCFM Certification, in this article we are providing you the complete information about NCFM certification details, different modules, eligibility, registration, career opportunities etc. 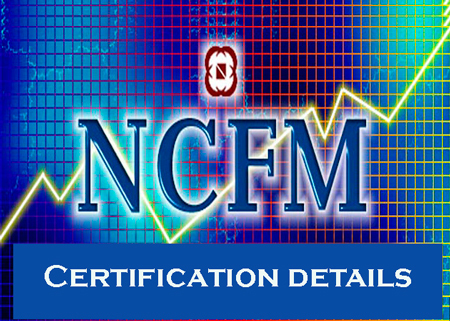 NCFM stands for National Stock Exchange’s Certification in Financial Markets. NCFM program is an online testing and certification program that tests the practical knowledge and skills require to operate in the financial markets offers by National Stock Exchange Academy. It is a nationally recognized certification which is mandatory for various professionals in capital markets in India. In this certification program you have thoroughly studied and learnt about the required financial skills. NCFM examinations are designed for developing pool of human resources having right skills and expertise on each segment of financial market for quality intermediation to market participants. It provides knowledge of various segments of financial market through a system of testing and certification. There are no restrictions of age or qualification for registration to the NCFM certification examination. Computer literacy will be beneficial while answering the test. This test is completely online, using a highly user-friendly web based application. Interested students or professionals, all approved users and sales personnel of trading members of recognized stock exchanges and even other individuals can take this NCFM program. You can join NCFM by registering yourself for the program by filling up the prescribed registration form. The form could be forwarded to any of the six offices of National Stock Exchange of India Ltd. Candidates can also use the online enrollment facility for registration and for selecting of test dates and time slots. NCFM certification is useful those who want to begin a career in the financial markets in India to learn the fundamental of capital market. It discusses the operational aspects of equity markets namely trading, clearing and settlement, trading membership, legal framework and IPO’S in the stock markets. This certification is mandatory as per SEBI rules to get jobs in financial markets. Once you complete this certification program you can enter into the stock market as a trainee. After gain experience you can get involved in four main career involved with the stock exchange proceedings depending on your interest. Bright Careers can be made exciting opportunities with reputed Brokerage Houses, Asset Management companies, Investment Bankers. The stockbroker buys the securities and sells to market makers on behalf of investors. They may advise investors how to get best out of their own investments. Market makers are the wholesale dealers who buy and sell stocks and shares in their own account to make a profit. Investment analysts provide investors and stockbrokers with information to help them decide which securities to invest in. The work tend to fall into two categories, stock broking analysts and institutional analysts. It is a central administrative and regulatory body, employs the staff.